Saturday night at Umstead Park United Church of Christ Raleigh, The Justice Theater Project hosted their 2nd Annual Send A Kid To Camp VIP Party. The fundraising event in support of Help Send A Kid To Camp featured food and drinks, a Silent Auction and performances by fabulous singers. Each summer JTP provides $10,000 in tuition assistance to Triangle families during the five weeks of professionally run youth summer theater camps. Onlookers preparing to make their bids. 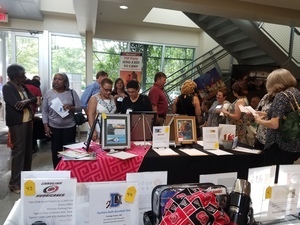 Items up for grab in the Silent Auction included a $1,200 gourmet private chef dinner for 8 with wine pairing by Cordon Bleu trained chef Steve Day of Plates Kitchen and a weekend in New Bern with a boat charter for six. 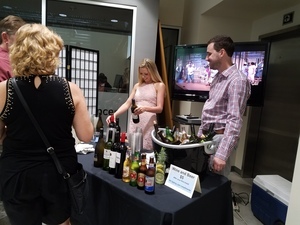 Attendees had their tastes satiated with a selection of beer, wines and a buffet of dishes catered by Catfish Row, which they enjoyed inside the beautiful lobby area and under a large outdoor tent and with overhead coverage in case of stray rain. The proceedings were then transitioned into the theater where the event was capped off by a performance of George Gershwin’s “Porgy and Bess”, currently on stage at The Justice Theater Project through June 25. 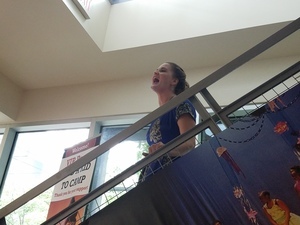 Led by Master of Ceremonies, Rozlyn Sorrell, five JTP favorites performed 2 songs each.